Violet Grove in Castle Douglas, Dumfries and Galloway sleeps 4 people. Violet Grove in Castle Douglas is a beautifully presented, semi-detached cottage, set quietly back from the road with stunning views over the Carlingwark Loch. 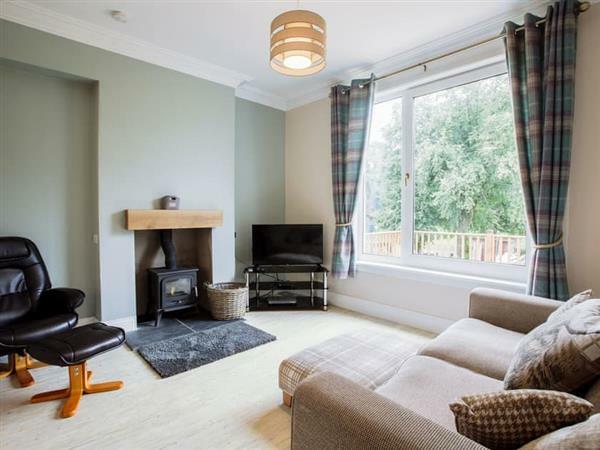 With a cosy wood burner in the open plan living space and a large picture window to the front taking in the view of the loch, this is the perfect place to relax after a day enjoying this delightful, unspoilt corner of Dumfries and Galloway. An added bonus is that the cottage is just minutes from the centre of the ’food town’ of Castle Douglas. This small, delightful market town offers an array of independent shops selling produce and quality gifts. If you want to explore more of this beautiful area then you are in luck as attractions are in abundance, from beautiful sandy beaches to dramatic cliff tops. With sailing, swimming, horse riding, fishing, golf, boat trips and water sports all close by, there is something for everyone. Warmed by the Gulf Stream, there are many beautiful gardens to visit including National Trust Threave Garden. Close to the Galloway Forest Park, home to the first Dark Sky Park in Europe, and central to 5 of the 7Stanes, at Kirroughtree Forest and Dalbeattie Forest, it is a popular location for cyclists and mountain bikers. Kirroughtree has some of the best technical single track mountain bike trails in Scotland. There is a beach 13 miles from Violet Grove in Castle Douglas. With the shop, pub and restaurant 400 yards from Violet Grove. Kitchen area: With electric oven, gas hob, fridge, freezer, dishwasher and washing machine. Gas central heating, gas, electricity, bed linen, towels and Wi-Fi included. Initial logs for wood burner included. Welcome pack. Decked area with garden furniture. Bike store. Private parking for 1 car; additional on road parking. No smoking. Holidays at Violet Grove run from Friday to Friday. Pets allowed at Violet Grove. For a better idea of where Violet Grove is, you can see Violet Grove on the map below. Violet Grove is in Kirkcudbrightshire; should you be on the lookout for a special offer, you can find all the special offers in Kirkcudbrightshire. It's always worth checking to see what is on offer at the moment. Do you want to holiday near Violet Grove (UK5982), you can see other cottages within 25 miles of Violet Grove; have a look to find your perfect holiday location.